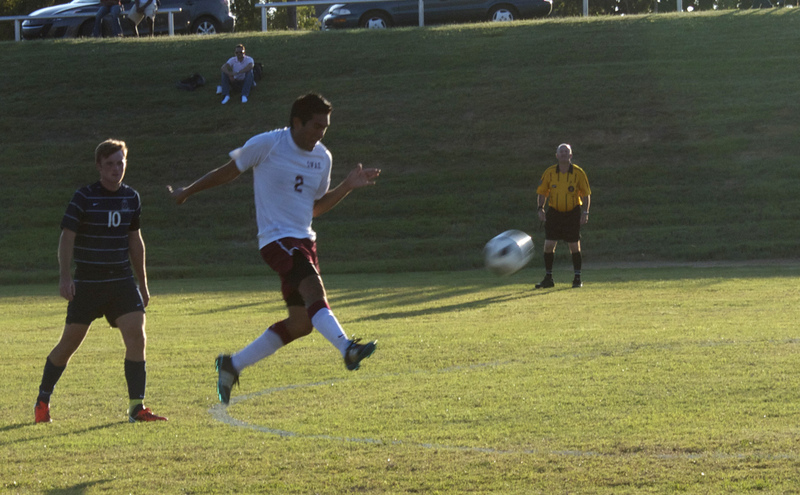 Josue Maldonaldo kicks a good one against Hillsdale Freewill Baptist in Thursday's game. The Lady Knights volleyball team and the Knights soccer team started Southwestern Adventist University’s sports season, Thursday, Aug. 30. Both teams played well; the volleyball team was not able to win, but the soccer team was. The Knights soccer team obliterated Hillsdale Freewill Baptist 4-0. The Knights controlled the game, with three players scoring the four goals. Sammy Hernandez provided two points, with Deivi Garcia and Jeffery Michel each chipping in a goal for the Knights. The soccer team was able to defeat a team that beat them handily before in the past couple of years. Unfortunately, the good fortunes of the soccer team did not continue with the volleyball team. Although they put up a good fight, the Lady Knights weren’t able to come through with the win. After a close win in the first set, 26-24, they couldn’t continue the momentum and lost the second set 18-25. They weren’t able to come through in the third set either and lost the match. Here’s hoping that all the sports teams perform well and show sportsmanship this year. IT's great to read your writing again, Justin! Good job reporting and I appreciated reading the news online.